To Cite: Teimourpour R, Peeridogaheh H, Arzanlou M, Gholoobi A, Sankian M, et al. Co-Expression of hbha and mtb32C Genes from Mycobacterium tuberculosis H37Rv in a Prokaryotic System, Jundishapur J Microbiol. 2018 ; 11(2):e14030. doi: 10.5812/jjm.14030. Background: Heparin-binding hemagglutinin (HBHA) protein is a surface adhesin that mediates the attachment of Mycobacterium tuberculosis to host cells by its own unique, carboxyl-terminal region. The methylated HBHA has a specific motif with a lysine-, alanine-, and proline-rich domain. More recently, it has been shown that HBHA protein has potential activity in stimulating immune responses, and is a promising new candidate for diagnostic applications besides a protective antigen against tuberculosis. Objectives: The aim of this study was to isolate a mycobacterial latency gene (hbha), and subsequently produce its protein as a new antigen for the Interferon-Gamma Release Assay test (IGRAs). Methods: In the present work, hbha and mtb32C genes were isolated from the Mycobacterium tuberculosis H37Rv genome using the polymerase chain reaction (PCR) method. The PCR products and pet21+ vector were digested with specific restriction enzymes and then submitted to the ligation procedure. Escherichia coli BL21-CodonPlus (DE3) competent cells were transformed with the recombinant mtb32C-hbha -pet21+ vector. 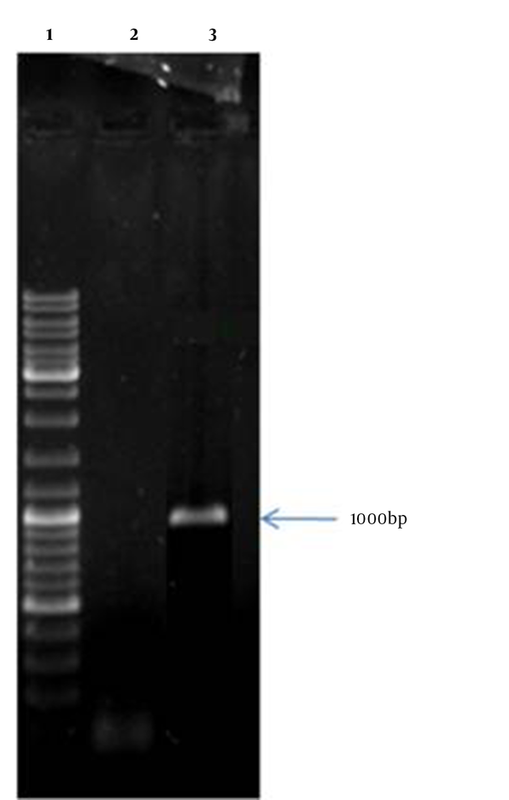 Expression of recombinant protein (Mtb32C-HBHA) was confirmed with Sodium Dodecyl Sulfate Polyacrylamide Gel Electrophoresis (SDS-PAGE) and western blot methods. Results: Detection of a 500-bp gene and sequencing of recombinant pet-mtb32C-hbha vector, all confirmed the accuracy of the cloning procedure. A 36-KDa band of Mtb32C-HBHA protein was also detected by western blotting. Conclusions: In this study, expression of Mtb32C-HBHA protein was successfully done, in the prokaryotic system. Further studies are needed to evaluate the efficacy of recombinant Mtb32C-HBHA protein in diagnosis of latent tuberculosis. Copyright © 2018, Jundishapur Journal of Microbiology. This is an open-access article distributed under the terms of the Creative Commons Attribution-NonCommercial 4.0 International License (http://creativecommons.org/licenses/by-nc/4.0/) which permits copy and redistribute the material just in noncommercial usages, provided the original work is properly cited. Mycobacterium tuberculosis, the causative agent of tuberculosis, is a strike aerobic, intracellular pathogen, which in most cases enter the body via the respiratory tract. In 2012, the world health organization (WHO) reported 8.6 million cases of tuberculosis worldwide with most occurrences reported in Asia (58%) and Africa (27%). From the site of initial infection, the lungs, the tubercle bacilli spread to other parts of the body through the lymphatic or blood vessels. Tuberculosis remains a significant difficulty for human health in most parts of the world, with about two million deaths, annually (1, 2). Epidemiologically, 30% of infected individuals do not have any signs of tuberculosis disease and are unable to spread infection to others. This condition is known as latent tuberculosis infection, for the diagnosis of which there are currently two main tests, including tuberculin skin test (TST) and interferon-gamma release assays (IGRAs). Tuberculin skin test has a diagnostic challenge in diagnosis of tuberculosis because it has a low specificity and there is cross-reactivity with environmental mycobacteria and Bacille Calmette-Guerin (BCG) vaccine in vaccinates (3, 4). Over the past decade, many studies have resulted in the design and development of a new diagnostic method, known as Interferon-gamma release assays (IGRAs). These assays are based on the principle that the T-cells of individuals, who have been infected with M. tuberculosis, secrete interferon gamma (IFN)-γ in response to specific antigens of M. tuberculosis. Furthermore, IGRAs were developed to replace conventional tuberculin skin test for the diagnosis of latent tuberculosis infection because IGRAs have high specificity and several advantages over TST (4). Heparin-binding hemagglutinin (HBHA) protein is a mycobacterial adhesin and virulence factor that is required for dissemination of M. tuberculosis from the lung to internal organs, such as the spleen. Absence of the hbha gene in mutant strains leads to deficiency in extra-pulmonary dissemination (5-7). The hbha gene present in M. tuberculosis and BCG genome is responsible for binding of bacteria to alveolar epithelial cells (8-10). Its C-terminal domain bears post translational modification; methylation of repeated lysine-rich motifs. Previous studies indicated that HBHA is an immunogenic antigen and plays a significant role in inducing humoral and cellular immune responses (11-14). HBHA protein could induce high levels of anti-HBHA antibodies and interferon gamma (IFN)-γ from T-lymphocytes in most patients infected with M. tuberculosis compared to BCG-immunized individuals. These studies suggest that HBHA protein is an appropriate antigen for tuberculosis diagnostic tests, such as IGRAs. In fact, the cornerstone of the immune response to mycobacterial infection is the production of gamma-interferon (IFN)-γ by CD4 cells. Interferon-gamma release assays (IGRAs) are new techniques for diagnosis of latent tuberculosis infection, and HBHA antigen is used as a new candidate for IGRAs (15-17). In the present study, hbha gene along with mtb32C genes were isolated from M. tuberculosis H37Rv strain and cloned in the pet21+ vector for enhancing expression and raising antigenicity of the hbha gene. The expression of recombinant plasmid was verified in Escherichia coli BL21 (DE3) CodonPlus strain. The entire DNA of M. tuberculosis was prepared as described, previously (18). By using specific primers designed with DNAMAN (Lynnon Biosoft version 5.2) and Gene Runner (Version 3.05, Hastings Software Inc.) software, the mtb32C and hbha genes were isolated from the M. tuberculosis H37Rv genome. Two sets of primers were used as follows: 5’-ATATCATATGACGGCCGCGTCCGATAACT-3’ as the forward primer and 5’- ATATGAATTCAGCAGGGGGTCCCTCGGCCAATGT-3’ as the reverse primer for mtb32C and 5’- ATATGAATTCATGGCTGAAAACTCGAACATT-’3 as the forward primer and 5’- ATATGGATCCCTAatgatgatgatgCTTCTGGGTGACCTTCTT -3’ as the reverse primer for the hbha gene. Underlined letters indicate NdeI, EcoRI, and BamHI restriction sites, respectively. Small and bold letters in the reverse primer of hbha gene represent 4 Histidine (His)-tag and stop codon sequences. Polymerase Chain Reaction (PCR) was used for genes amplification. The mixture containing 1 μg of the DNA sample, 2.5 mM MgCl2 (Fermentas, Germany), 0.5 mM of each dNTPs (Fermentas, Germany), 10 pmol of each primer (CinnaGen, Iran), and 1 unit of Taq polymerase (CinnaGen, Iran) was prepared and then transferred to a thermocycler (Applied Biosystem,USA). Thermocycling conditions for amplification of both mtb32C and hbha genes was 35 cycles (95°C for 1 minute, 58°C for 1 minute, and 72°C for 1 minute) after an initial denaturation step of at 95°C for 5 minutes. 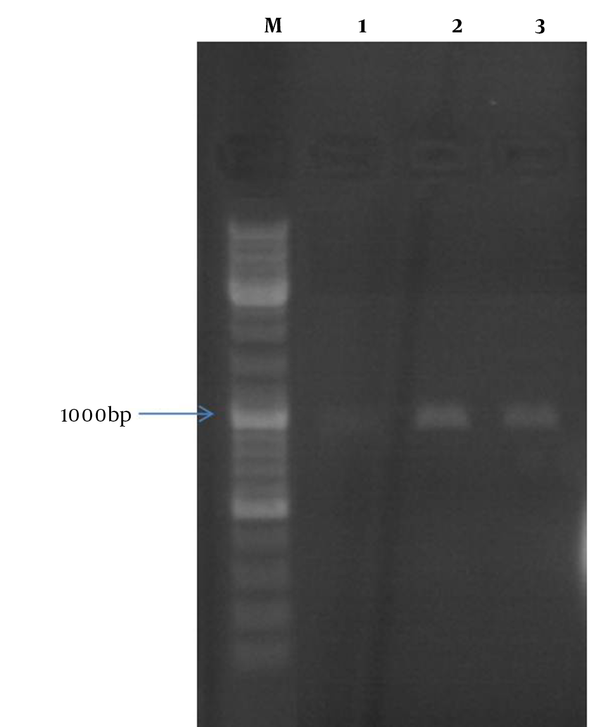 Finally, amplified DNA fragments were assessed by agarose gel electrophoresis and stained with the Green Viewer (Pars Tous, Iran). First, the hbha gene and pet 21+ were digested with BamHI and EcoRI restriction enzymes and then ligated together as described in a previous paper (18). Pet21 + vector containing the hbha gene and PCR product of the mtb32C gene were digested with NdeI and EcoRI and subsequently fused together using the T4 DNA ligase enzyme. All digestion and ligation procedures were described in detail, previously (19). To confirm the presence of mtb32C - hbha mRNA in transformed E. coli BL21 (DE3) CodonPlus cells with recombinant vector, the RT-PCR method was employed. All procedures were performed according to the manufacturer’s instructions and previous studies (18-20). 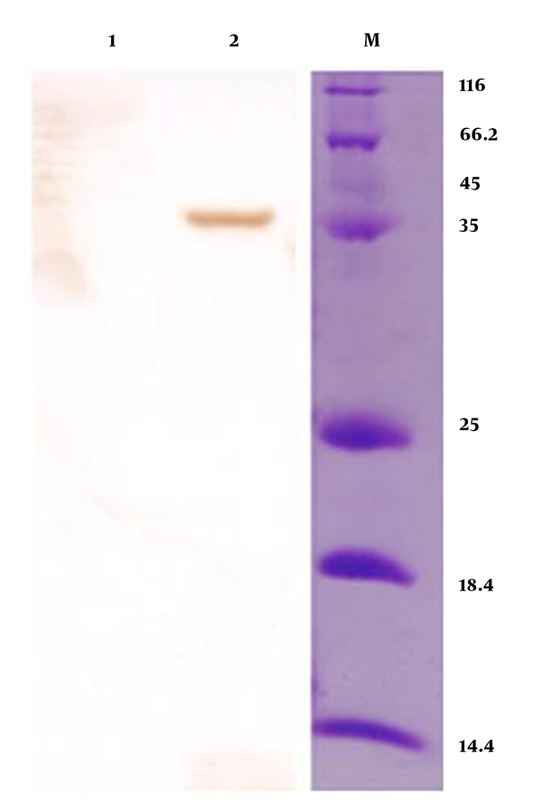 To study the expression and production of Mtb32C-HBHA recombinant protein, SDS-PAGE and Western blot methods were employed. Transformed E. coli BL21 (DE3) CodonPlus cells with recombinant vector were cultured in Luria-Bertani (LB) broth medium at 37°C for 16 hours. After the incubation period, Isopropyl β-D-1-Thiogalactopyranoside (IPTG) (Sigma, USA) at a final concentration of 1 mM was added and after 2 hours, 1 mL of cell culture was centrifuged and mixed with 2x loading buffer (100 mM Tris-Cl, pH = 6.8; 4% (w/v) Sodium Dodecyl Sulfate (SDS); electrophoresis grade, 0.2% (w/v) bromophenol blue, 20% (v/v), and glycerol, 200 mM dithiothreitol (DTT). The mixture was boiled for 5 minutes at 100 ºC. The prepared sample was electrophoresed on 12% Sodium Dodecyl Sulfate Polyacrylamide Gel Electrophoresis (SDS-PAGE). The presence of recombinant Mtb32C-HBHA protein was confirmed using specific antibodies in Western blot analysis (19, 20). The recombinant vector containing mtb32C and hbha genes from M. tuberculosis H37Rv was constructed. This vector was (mtb32C-hbha-pet21+) sequenced with the T7 promoter and T7 terminator primers that showed 100% identity with related sequences in Genbank. Colony -PCR and sequencing methods confirmed correction of all cloning procedures (Figure 1). The production of related mRNA and chimeric protein of about 35.5 kDa was confirmed with the RT-PCR method and Western blot analysis using anti-His Tag antibody, respectively (Figures 2 and 3). Despite available vaccines, drugs, and diagnostic methods, tuberculosis infection remains as a concern in the 21st century and is still the leading cause of death more than any other single infectious disease. The lungs are the initial route of infection and M. tuberculosis could enter and replicate within the resident alveolar macrophage, dendritic cells, and epithelial cells (pneumocytes), using several receptors. It has been estimated that two billion people worldwide have latent infection and are at risk of active tuberculosis (21-23). Latent tuberculosis is defined as a condition, in which M. tuberculosis remains inside an infected macrophage in dormant state without any clinical manifestations. It has been estimated that one-third of the world’s population has LTBI. About 5% to 10% of individuals, who have latent tuberculosis will experience reactivation of active tuberculosis with defined clinical symptoms in their lifetime while this rate will be higher in immunocompromised patients. In fact, subjects with latent infection serve, as a source of tuberculosis infection and a serious threat for healthy people and the community. Any changes in the immune system after exposure to specific conditions, such as malnutrition, acute infections, or other suppressive immunity conditions increase the risk of active tuberculosis (24-26). The identification and treatment of LTBI is a principle part of tuberculosis control strategies and decreases the incidence of disease reactivation. The risk of progression of LTBI to active disease is very high within patients with immunocompromised conditions, chronic renal failure disease or patients receiving chemotherapy (25). Treatment of latent tuberculosis with isoniazid reduces risk of progression of disease towards active and contagious forms by 75% to 90%. Nowadays, tuberculin skin test (TST) is the most widely used diagnostic test for LTBI that was first described by Koch in 1890 and developed by Mantoux in 1907. The TST is based on delayed hypersensitivity responses (DTH) of memory T cells to purified protein derivative (PPD) from M. bovis. Tuberculin skin test is a simple and cost effective, and the world health organization (WHO) has approved the test for the recognition of prior exposure to M. tuberculosis. Sensitivity of the test in patients with positive culture for M. tuberculosis ranges between 70% and 90%, however, this test has low specificity with several disadvantages, including false-negative results, which may be common in immunosuppressed individuals, and very young or very old cases. False-positive results could be due to BCG-vaccinated people and in those, who are in contact with non-tuberculous mycobacteria. Other limitations are as follows, a need for a patient visit after PPD administration, inter-observer variability and disability in differentiating recent from latent infection. As a result, TST is not considered as a gold standard test (27, 28). The low specificity of TST is related to the PPD used for TST that encompasses abundant antigens that are nearly the same as in BCG or non-tuberculous mycobacterium antigens, therefore more accurate tests, for detecting active tuberculosis is urgently needed (29). The current antigen is introduced for IGRAs to detect LTBI. The IGRA (IFN-γ) is a novel test based on the measurement of IFN-γ release from sensitized T cells in response to mycobacterial-specific antigens, which is used for tuberculosis diagnosis. Nowadays, ESAT-6, CFP-10, and tuberculosis 7.7 antigens are used in IGRA because they are extremely specific to M. tuberculosis. In these tests, the amount of interferon-gamma released from sensitized T lymphocytes are measured by T-SPOT. Tuberculosis and quantity FERON-tuberculosis are 2 commercially gold standard diagnostic tests for diagnosis of tuberculosis infection (29-31). Using IGRA tests, people, who were infected with tuberculosis could be distinguished from vaccinated or individuals infected with non-tuberculosis mycobacteriu M. tuberculosis tests are more specific than TST because they are able to detect tuberculosis infection from BCG vaccinated individuals yet they cannot discriminate old infections from recent infections. More recently, several studies reported the use of HBHA protein as HBHA-IGRA test for detection of latent tuberculosis disease. Heparin-binding hemagglutinin protein participates in extra pulmonary tuberculosis that may involve other organ of the body (29, 32). In one study, Dessein et al. reported that native HBHA protein, purified from BCG, was used in IGRA test for detection LTBI in dialysis patients (33). This study showed that naive HBHA-IGRA compared to QFT is much more sensitive for the detection of LTBI. Hougardy et al. demonstrated that HBHA protein-based IGRA test could more efficiently detect latent infection (> 2 years) than tuberculosis gold in-tube (QFT-IT) test (31). In all previous studies, native HBHA protein was used and none of them evaluated the recombinant form (34). Considering that HBHA protein has an important role in infectivity, pathogenesis, and detection of M. tuberculosis and the native HBHA protein elicits different immune responses compared to the recombinant form, this study produced a fusion protein (Mtb32C-HBHA) in the prokaryotic system. Many more studies would be required for identification of Mtb32C-HBHA utility for the detection of M. tuberculosis infection in latent patients. This work was supported by a grant (No. 910016) from the Mashhad University of Medical Sciences. Roghayeh Teimourpour and Hadi peerdogaheh contributed equally in this study. 1. Organization WH. Global tuberculosis report. 2014. Available from: www.who.int/tb. 2. Dara M, Dadu A, Kremer K, Zaleskis R, Kluge HH. Epidemiology of tuberculosis in WHO European Region and public health response. Eur Spine J. 2013;22 Suppl 4:549-55. doi: 10.1007/s00586-012-2339-3. [PubMed: 22565803]. 3. Yilmaz N, Zehra Aydin S, Inanc N, Karakurt S, Direskeneli H, Yavuz S. Comparison of QuantiFERON-TB Gold test and tuberculin skin test for the identification of latent Mycobacterium tuberculosis infection in lupus patients. Lupus. 2012;21(5):491-5. doi: 10.1177/0961203311430700. [PubMed: 22140142]. 4. Herrera V, Perry S, Parsonnet J, Banaei N. Clinical application and limitations of interferon-gamma release assays for the diagnosis of latent tuberculosis infection. Clin Infect Dis. 2011;52(8):1031-7. doi: 10.1093/cid/cir068. [PubMed: 21460320]. 5. Ribeiro-Guimaraes ML, Pessolani MC. Comparative genomics of mycobacterial proteases. Microb Pathog. 2007;43(5-6):173-8. doi: 10.1016/j.micpath.2007.05.010. [PubMed: 17611072]. 6. Rindi L, Lari N, Garzelli C. Search for genes potentially involved in Mycobacterium tuberculosis virulence by mRNA differential display. Biochem Biophys Res Commun. 1999;258(1):94-101. doi: 10.1006/bbrc.1999.0591. [PubMed: 10222241]. 7. Menozzi FD, Bischoff R, Fort E, Brennan MJ, Locht C. Molecular characterization of the mycobacterial heparin-binding hemagglutinin, a mycobacterial adhesin. Proc Natl Acad Sci U S A. 1998;95(21):12625-30. [PubMed: 9770536]. 8. Vidal Pessolani MC, Marques MA, Reddy VM, Locht C, Menozzi FD. Systemic dissemination in tuberculosis and leprosy: do mycobacterial adhesins play a role?. Microbes Infect. 2003;5(7):677-84. [PubMed: 12787744]. 9. Locht C, Hougardy JM, Rouanet C, Place S, Mascart F. Heparin-binding hemagglutinin, from an extrapulmonary dissemination factor to a powerful diagnostic and protective antigen against tuberculosis. Tuberculosis (Edinb). 2006;86(3-4):303-9. doi: 10.1016/j.tube.2006.01.016. [PubMed: 16510310]. 10. Guerrero GG, Feunou F P, Locht C. The coiled-coil N-terminal domain of the heparin-binding haemagglutinin is required for the humoral and cellular immune responses in mice. Mol Immunol. 2008;46(1):116-24. doi: 10.1016/j.molimm.2008.07.009. 11. Sato K, Tomioka H, Shimizu T, Gonda T, Ota F, Sano C. Type II alveolar cells play roles in macrophage-mediated host innate resistance to pulmonary mycobacterial infections by producing proinflammatory cytokines. J Infect Dis. 2002;185(8):1139-47. doi: 10.1086/340040. [PubMed: 11930324]. 12. Rouanet C, Debrie AS, Lecher S, Locht C. Subcutaneous boosting with heparin binding haemagglutinin increases BCG-induced protection against tuberculosis. Microbes Infect. 2009;11(13):995-1001. doi: 10.1016/j.micinf.2009.07.005. [PubMed: 19635582]. 13. Guerrero GG, Locht C. Recombinant HBHA boosting effect on BCG-induced immunity against Mycobacterium tuberculosis infection. Clin Dev Immunol. 2011;2011:730702. doi: 10.1155/2011/730702. [PubMed: 21647410]. 14. Hougardy JM, Schepers K, Place S, Drowart A, Lechevin V, Verscheure V, et al. Heparin-binding-hemagglutinin-induced IFN-gamma release as a diagnostic tool for latent tuberculosis. PLoS One. 2007;2(10). e926. doi: 10.1371/journal.pone.0000926. [PubMed: 17912342]. 15. Bruggemann H, Gottschalk G. Insights in metabolism and toxin production from the complete genome sequence of Clostridium tetani. Anaerobe. 2004;10(2):53-68. doi: 10.1016/j.anaerobe.2003.08.001. [PubMed: 16701501]. 16. Skeiky YAW, Alderson MR, Ovendale PJ, Guderian JA, Brandt L, Dillon DC, et al. Differential Immune Responses and Protective Efficacy Induced by Components of a Tuberculosis Polyprotein Vaccine, Mtb72F, Delivered as Naked DNA or Recombinant Protein. J Immunol. 2004;172(12):7618-28. doi: 10.4049/jimmunol.172.12.7618. 17. Masungi C, Temmerman S, Van Vooren JP, Drowart A, Pethe K, Menozzi FD, et al. Differential T and B cell responses against Mycobacterium tuberculosis heparin-binding hemagglutinin adhesin in infected healthy individuals and patients with tuberculosis. J Infect Dis. 2002;185(4):513-20. doi: 10.1086/338833. [PubMed: 11865404]. 18. Baghani A, Youssefi M, Safdari H, Teimourpour R, Meshkat Z. Designing and Construction Pcdna3.1 Vector Encoding Cfp10 Gene of Mycobacterium tuberculosis. Jundishapur J Microbiol. 2015;8(10). e23560. doi: 10.5812/jjm.23560. [PubMed: 26587210]. 19. Teimourpour R, Sadeghian A, Meshkat Z, Esmaelizad M, Sankian M, Jabbari AR. Construction of a DNA Vaccine Encoding Mtb32C and HBHA Genes of Mycobacterium tuberculosis. Jundishapur J Microbiol. 2015;8(8). e21556. doi: 10.5812/jjm.21556. [PubMed: 26464766]. 20. Sambrook J, Fritsch EF, Maniatis T. Molecular cloning: a laboratory manual. Cold spring harbor laboratory press; 1989. 21. Skeiky YA, Alderson MR, Ovendale PJ, Guderian JA, Brandt L, Dillon DC, et al. Differential immune responses and protective efficacy induced by components of a tuberculosis polyprotein vaccine, Mtb72F, delivered as naked DNA or recombinant protein. J Immunol. 2004;172(12):7618-28. [PubMed: 15187142]. 22. van de Vosse E, Hoeve MA, Ottenhoff TH. Human genetics of intracellular infectious diseases: molecular and cellular immunity against mycobacteria and salmonellae. Lancet Infect Dis. 2004;4(12):739-49. doi: 10.1016/S1473-3099(04)01203-4. [PubMed: 15567123]. 23. Lamberti M, Uccello R, Monaco MGL, Muoio M, Feola D, Sannolo N, et al. Tuberculin skin test and Quantiferon test agreement and influencing factors in tuberculosis screening of healthcare workers: a systematic review and meta-analysis. J Occup Med Toxicol. 2015;10:2. doi: 10.1186/s12995-015-0044-y. [PubMed: 25670962]. 24. Druszczynska M, Kowalewicz-Kulbat M, Fol M, Wlodarczyk M, Rudnicka W. Latent M. tuberculosis infection--pathogenesis, diagnosis, treatment and prevention strategies. Pol J Microbiol. 2012;61(1):3-10. [PubMed: 22708341]. 25. Lalvani A, Pareek M. A 100 year update on diagnosis of tuberculosis infection. Br Med Bull. 2010;93:69-84. doi: 10.1093/bmb/ldp039. [PubMed: 19926636]. 26. Kunst H. Diagnosis of latent tuberculosis infection: the potential role of new technologies. Respir Med. 2006;100(12):2098-106. doi: 10.1016/j.rmed.2006.02.032. [PubMed: 16650976]. 27. Norton BL, Holland DP. Current management options for latent tuberculosis: a review. Infect Drug Resist. 2012;5:163-73. doi: 10.2147/IDR.S29180. [PubMed: 23226700]. 28. Nayak S, Acharjya B. Mantoux test and its interpretation. Indian Dermatol Online J. 2012;3(1):2-6. doi: 10.4103/2229-5178.93479. [PubMed: 23130251]. 29. Blumberg HM, Kempker RR. Interferon-gamma release assays for the evaluation of tuberculosis infection. JAMA. 2014;312(14):1460-1. doi: 10.1001/jama.2014.4928. [PubMed: 25291583]. 30. Dheda K, van Zyl-Smit RN, Meldau R, Meldau S, Symons G, Khalfey H, et al. Quantitative lung T cell responses aid the rapid diagnosis of pulmonary tuberculosis. Thorax. 2009;64(10):847-53. doi: 10.1136/thx.2009.116376. [PubMed: 19592392]. 31. Trajman A, Steffen RE, Menzies D. Interferon-gamma release assays versus tuberculin skin testing for the diagnosis of latent tuberculosis infection: an overview of the evidence. Pulm Med. 2013. 2013:601737. doi: 10.1155/2013/601737. [PubMed: 23476763]. 32. Pang CS, Shen YC, Tian PW, Zhu J, Feng M, Wan C, et al. Accuracy of the interferon-gamma release assay for the diagnosis of tuberculous pleurisy: an updated meta-analysis. PeerJ. 2015;3. e951. doi: 10.7717/peerj.951. [PubMed: 26038718]. 33. Host H, Drobecq H, Locht C, Menozzi FD. Enzymatic methylation of the Mycobacterium tuberculosis heparin-binding haemagglutinin. FEMS Microbiol Lett. 2007;268(2):144-50. doi: 10.1111/j.1574-6968.2007.00636.x. [PubMed: 17263844]. 34. Kim KH, Yang CS, Shin AR, Jeon SR, Park JK, Kim HJ, et al. Mycobacterial Heparin-binding Hemagglutinin Antigen Activates Inflammatory Responses through PI3-K/Akt, NF-kappaB, and MAPK Pathways. Immune Netw. 2011;11(2):123-33. doi: 10.4110/in.2011.11.2.123. [PubMed: 21637390].